The Rav’s father, Rav Aaron Teitelbaum, Hy”d (1881-1944) a grandson of Rebbe Eliezer Nisan Teitelbaum (1786-1855), Drohabitcher Rebbe was the Volover Rav. The Drohabitcher Rebbe was the son of the Yismach Moshe. He is not buried in the Satmar section, the Nirbater Kehila has a separate Chejka across from Satmar & its note worthy that he is buried in a Ohel. 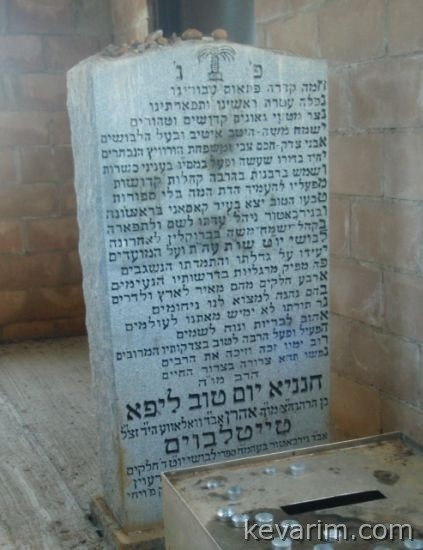 The Drohabitcher Rebbe son was Rebbe Samuel Teitelbaum the Gorlitzer Rebbe. I?m not sure if he was related to Rebbe Boruch of Gorlitz, the son of the Sanzer. R’ Baruch Halberstam of Gorlitz was the SIL of the Yetev Lev of a Sighet who was a brother to R’ Schmiel. The NyrBatur Rav was the grandson of R’ Yokel of Volove who was the son of R’ Schmiel Gorlitzer and the SIL of his uncle the Yetev Lev.